Get Creative in the Newly Renovated Martin ArtQuest Gallery! The mission of the Martin ArtQuest Gallery (MAQ) is to create a fun and engaging learning environment where visitors of all backgrounds, ages, and abilities experience hands-on activities that promote connections, creativity, and critical thinking. Martin ArtQuest (MAQ) has been Nashville’s premier destination for hands-on art experiences since opening in 2001. Visitors of all ages, but especially children, have participated in activities that create delight, wonder, and inspiration. MAQ’s opportunities to explore a range of art-making strategies—drawing, animation, printmaking, painting, and sculpture, each using high-quality materials with the support of professional educators—are accessible to all. MAQ helps participants find their unique talents and voices, celebrate their creative energy, and have fun! MAQ makes each individual’s passion possible and serves as a place of inspiration and immersion. MAQ is consistently ranked as one of the top activities for children and families in the Nashville area. In June 2013, USA Today named the Frist Art Museum as one of two art institutions included among top ten great family museums. The Nashville Scene and Nashville Parent Magazine have given accolades to the Frist Art Museum as one of the Best Hands-on Art Encounters, Best Places to Take Kids on a Rainy Day, and Favorite Kids’ Art Center. The MAQ-based television series ArtQuest: Art is All Around You, produced by Nashville Public Television in collaboration with Frist educators, won an Emmys for Children’s Programming in 2014 and 2015. • Explore the moving image using a large zoetrope, a shadow theater, and stop-motion animation. • Contribute to a collaborative textile-weaving installation using a large six-sided art deco grid. • Stations that explore Frist Art Museum exhibitions, artists, and ideas and include opportunities for visitor participation, dialogue, and response. MAQ is open seven days a week until 5:30 p.m.
• Monday through Saturday: 10:00 a.m.–5:30 p.m. The Frist Art Museum is closed on Thanksgiving, Christmas, and New Year’s Day. Schools, camps, community organizations, and homeschool co-ops are invited to include MAQ in their Frist Art Museum visits. Activities change regularly, and connections to art, literacy, history, STEAM., and 21st-century learning skills are ongoing. Our helpful staff and volunteers are always present to facilitate your art-making experience. Learn more or schedule a visit. MAQ activities are designed for multigenerational learning and engagement, so family members can enjoy quality time together. From animation to printmaking to building blocks, there is something for everyone. The Frist welcomes families throughout the museum with family restrooms and baby-changing stations, a quiet family-friendly lobby, and special food options in the café. We know families have many options for entertainment in Music City. We hope that your family creates lasting memories in MAQ and you visit us often. Spending time in MAQ is a great way to unplug and unwind, especially after visiting our exhibitions. Whether you’re on your own or with friends or loved ones, we invite you to connect with the world around and within you through making art. Artistic skill or experience not required—just a willingness to explore new, creative ways of expression. The Frist Art Museum welcomes visitors of all abilities. If you or someone with you needs special accommodations, please see a staff member. Explore MAQ’s concepts at home by visiting FristKids.org for videos, at-home activities, and lesson plans. The MAQ team is always looking for helpful hands and smiling faces! Our volunteers enjoy terrific benefits and are treated with gratitude. Learn more about volunteering. 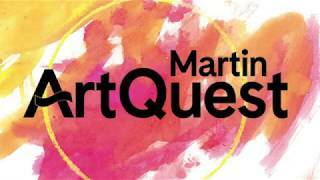 Take a quick survey and give us your feedback about the Martin ArtQuest Gallery. The Frist Art Museum welcomes gifts of any amount to support Martin ArtQuest. Thank you!